With funding generously provided by the New York State Council for the Arts with sponsorship from the Van Alen Institute, RANGE designers are developing a collaboration of community organizations, ecologists, materials scientists, designers, engineers and Bronx manufacturers to design modular coastal protection elements for waterfront public space test sites along the Bronx, East and Harlem Rivers. Range was awarded a grant for construction of the first Levee Lab prototype by the New York State Council on the Arts, . Building on interest in the resilience formula for PennDesign’s Hunts Point Lifelines project—WORKING WATERFRONT + WORKING COMMUNITY + WORKING ECOLOGY—we propose to develop a research collaboration that will create coastal protection and green infrastructure prototypes and, eventually, products for the working waterfront. The long-term goals of this effort are to demonstrate to government and businesses the feasibility of large-scale implementation of integrated coastal protection for working waterfronts, to support innovation in our region’s response to sea level rise, and to devise ways that communities can participate in the construction of their own protection, without compromising design or engineering integrity. The collaborators we will assemble and fund to work on R&D, design, prototyping, regulatory review, scientific monitoring and evaluation of new materials applications include leading designers, scientists and engineers, environmental organizations in the Bronx, steel, concrete and new materials makers in the Bronx, the Bronx Cooperative Development Initiative (BCDI) fabrication lab, and waterfront regulators. As the merit of Levee Lab prototypes is demonstrated, additional collaborators, perhaps advised by Wharton faculty, will support the creation of a Levee Lab Cooperative to lead marketing, manufacturing, installation, and education programs for maritime business owners and government staff to promote diffusion of innovations. Based on our collective professional expertise, Bronx-made coastal protection products will expand the limited range of off-the-shelf elements (such as reef balls and reef jacks), that are commonly specified by designers in waterfront and flood control projects. The approach also recognizes that support for scales of action and experimentation below huge government infrastructure projects is greatly needed. The Levee Lab extends the public / private and university / community partnership approach that powered the Lifelines coalition. The Levee Lab will be capitalized initially by seed money, grants and social venture capital. In time, revenues will provide ongoing general support for climate adaptation planning and demonstration projects. This business model allows for creation of new technologies and material strategies, high-quality jobs and community economic assets without relying on client-service relationships with risk-averse public agencies. 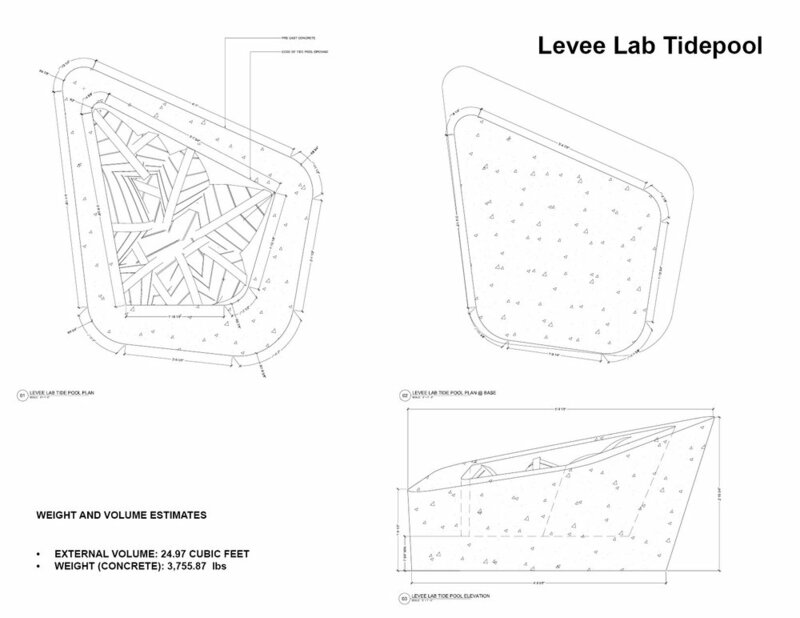 The Levee Lab concept grew out of the expressed desire of the New York State Department of Environmental Conservation to collaborate with communities and our university-anchored design team to advance the science and technology of coastal protection, and modernize the state’s regulatory framework to support adaptation. The community development approach is in sync with priorities of foundations eager to lead government practice, who will likely join seed funders once collaborators are seeded to produce an R&D and design plan.